The most wonderful time of the year for shopping has arrived ladies!!!!! The Nordstrom Anniversary Sale (early access) officially started yesterday! On Wednesday I got to go in with my mom to shop and have a peek at everything that’s a part of the sale this year. Here is a look I styled using some of my favorite pieces I picked up on Wednesday. 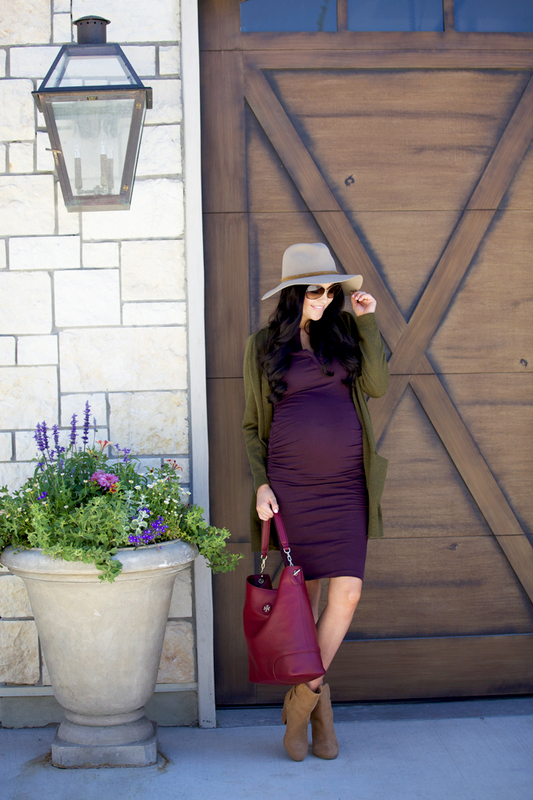 Every year I stock up on pieces that I know I’ll wear all fall and winter long so I’m always drawn to the essentials: a chunky cardi, comfy booties and of course a hat! These Rag & Bone booties are so comfortable and the chestnut brown color is so versatile. You all know I’m obsessed with hats so of course I had to get one. Below are more of my favorites from the sale!! I would love to hear what some of your favorite items from the NSale are!! Early access for Nordstrom credit card and debit cardholders only runs from July 14-21, regular access begins on July 22-Aug 7. Shop the full sale here!! Brought to you by Nordstrom and ShopStyle. Fantastic bag and boots, you’re such a stylish mommy! Loving this outfit. All the earthy tones are beautiful. Love that dress and those booties!! You always have the best and most colorful fall clothes Rach, the green sweater and booties are so cute. I love that dress and the cardigan! I can’t wait to shop the sale. That Rag & Bone booties is super cute! Love how it is part of the sale! Oh my goodness, these colors together are perfect! I would have never thought to pair them together, but I love how you’ve styled this. Thanks for sharing! love those fall colors! you look so cute! Where are all of your other favorites from this sale? I also picked up a pair of rag & bone booties. Love them. My VERY favorite this I got was the Louise et Cie Jael bag. I got it in the red color and LOVE it! You look awesome and this sale seriously is the best of the year! I snagged a fur vest and can not wait for fall to wear it ( cant believe I just said that) Hope you have a fabulous weekend! I love that plum shade on you!! Shopping the sale and seeing all these gorgeous posts have me seriously wishing it was already fall! Love your picks! 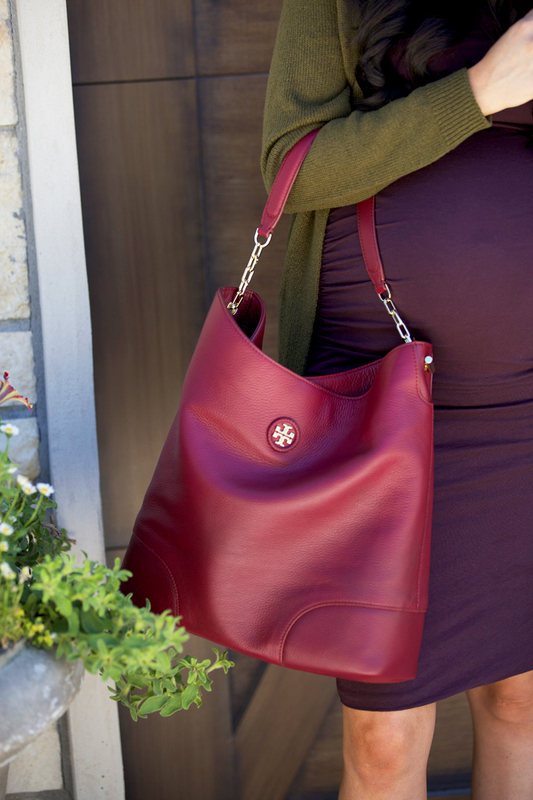 That bag is SO great for fall! What size did you get in the cardigan?! It’s super cute, but I’m debating between an xs or s. I’m usually between a 2-4. Thanks doll! I LOVE that look. Great color combo. Just one thing I have to mention that bothers me… it’s minor but I feel like I have to mention it. It’s “a part of the sale this year”. Apart means separation. Sorry but I had to. That bag is such a gorgeous color! Hi Rach! So sorry I haven’t commented in awhile. 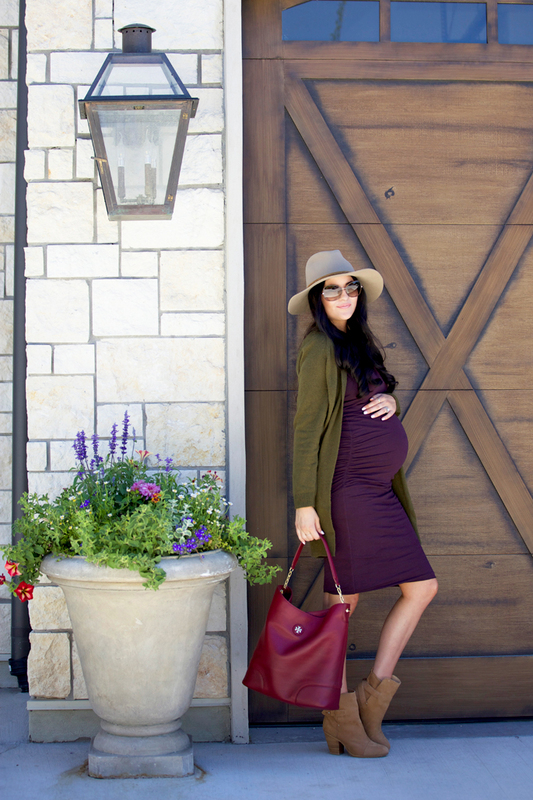 You are getting me so excited for fall with this look! What a gorgeous ensemble of fall colors!! I love how you created a look with all of your essential pieces. I love that cardigan but I couldn’t decide between all of the colors haha love this shade though! Don’t see the rest of your sake picks.., where is the link for the other items? what a chic, elegant but still casual look! I’ve been to Nordstrom twice in the past two days- oops! The sale is just that good! I LOVE the plum dress! Can you share where you found that? I absolutely love that cardigan! You’re making me so excited for fall fashion, absolutely love the whole dang outfit! You’re gorgeous lady! Ps. Love your blog! You are one my inspirations! I adore this look- and this carddiiiii!!!! You are glowing and I love your oxblood bag!